The reading below is an actual sample of an ancestor reading. When a client books a reading I request the first name of the person that they wish me to connect with along with the names of three other ancestors (deceased relatives or friends) in case I have difficulty making contact with their first choice. It is very important that I not know any other information beforehand. I make a connection clairvoyantly (clear seeing), and sometimes through smell, feeling, and hearing. Sometimes I will feel any ailments they suffered, ie. a pain in my head, or a shortness of breath. Ancestors will appear to me in different stages (ages) of their previous life, so that I can gather what is called 'evidence' which will prove, without a doubt that they are indeed the person called upon. I do find that names can often be wrong, not sure why this is. I usually do not pull a card from my oracle deck for this kind of reading unless I am specifically guided to do so (as in the reading below.) To finish each reading, I request a message for my client, from their ancestor and this is often very touching and heartfelt. If I do not connect with a client's first choice of ancestor the first time around, I am always willing to try and make a connection with another ancestor (free of charge.) One theory is that some ancestors are not interested in 'coming through' to that particular medium because they don't resonate with him/her. Each reading is discussed via email afterwards, this helps me become a better medium, in the process! - My very first impression of B... is round, warm, friendly and kind. - I see 4 kids, lots of kids! - She was a good mother and I see her tending them all. - I can see a military man and I see her waving goodbye to him. - I also see her managing, and steadfast. - Now I see 3 kids, not 4. - The color mint green also comes up. - She is taking charge. - I don’t see her husband around, but she is doing her best. - I see her wizened and grey at one point, and with young kids. She is being hard on herself because of this. - I also feel that she has developed a pain behind her eyes and that she is not able to ‘get a grip’ on things and that when she passed, it was a relief for her. - I ask her about you and she says the words, “nearest and dearest,” although she may not have expressed that to you physically. Initially I sensed that she was ‘warm’ but as the reading develops I feel that she was not able to express that warmth so easily. - I see her holding up your palm and tracing the lines. - She is trying to awaken you, make you mad, and make you think. 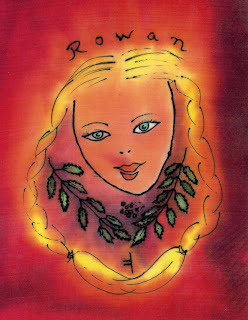 - She also instructs me to pull an oracle card for you so I pull one from my Celtic Tree Wisdom deck and it is called the Rowan card. The Rowan card represents the second lunar month, the “Moon of Vision.” It is a powerful tree of magic, also known as the Tree of Life. This is an oracular Moon symbolizing the rebirthing of the year. 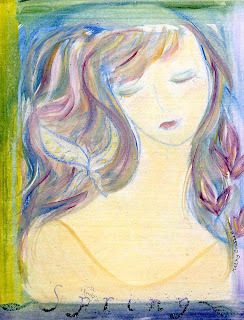 You are still asleep and dreaming, not quite ready to set your energies to growth. This Moon is dedicated to the goddesses Eleu, Diarmuid and Iris. "I was nervous about opening my ancestor reading, unsure of what to expect. So many of the things resonated with me, that I knew it was something to be treasured. I was really hoping for a connection with my mother and I feel you made one. Your gift is extraordinary." You can book your Ancestor reading here on my website.